Nancy Jr. is a 14 year old Llasa Apso. We rescued her at a local diner 14 years ago. 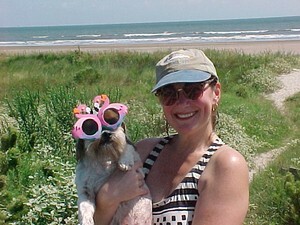 Nancy Jr likes wearing sunglasses, being around people instead of canines, and vacations with Mom. I love Nancy Jr.'s sunglasses - they really fit her style! She sounds like the perfect lapdog - spoiled rotten! Give her a big kiss from Missy's (an equally spoiled girl) Mom and God bless you both. My friend had a llasa apso and we would take her camping, to the desert and river. She had a blast. I love your doggies sunglasses and style. Nancy Jr. is cute and seems to enjoy the good life just like she should!